When I was in fifth grade my father took my brother and me to Chicago on the train for a weekend in the city. I loved being on the train; there were so many convenient little doo-dads for a kid to play with and appreciate. Fifty-plus years later I still get a kick out of riding a train, so I was happy to ride Amtrak’s Acela Express to Washington and back for my recent convention trip. Have you been to a major train station recently? Some stations such as New York’s Penn Station have essentially moved underground and lost their earlier hints at grand travel. 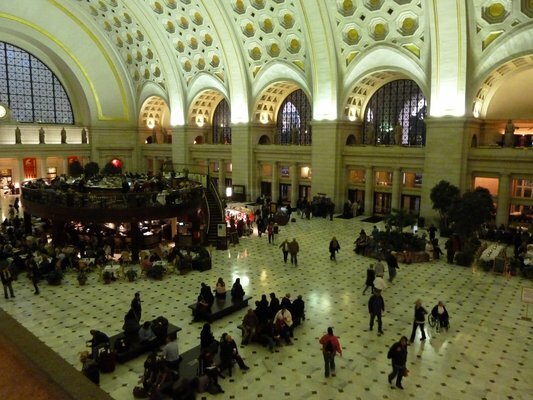 The original style and scale of Washington’s Union Station is still apparent. The grand architectural facades remain at others such as Boston’s South Station and Washington’s Union Station. Beyond the impressive entrance, the fast food vendors and shopping opportunities have crept into what used to be wide open marble floors. If you head from your arrival track straight to the subway, you can miss the grand architecture which remains and mistakenly think that this place too has sold out to the little money. It wasn’t until I came back to Union Station to depart that I saw how much open space remains to keep the spirit of travel alive. I had previously ridden Amtrak’s regional trains to New York city and the Newark airport, but had never tried the upscale, faster and more expensive Acela Express service. The main difference between the regional and the Acela service is speed. The trip from Boston to Washington takes 8 hours on the regional train, but only 6 1/2 hours on the Acela. The Acela goes faster and it makes fewer stops along the way. Though the early hope for Acela was that it would bring high speed train travel to the US, these trains do not have the speed or comfort of the TGV in France or the AVE trains in Spain. Acela is faster than what we had, but I would not call it a FAST train. Another big difference is that the minimum service on the Acela is Business class, with one car devoted to First class service. All seats are as roomy as a Business class seat on a domestic flight. You have more legroom than any domestic flight allows. Each seat has its own tray table, reading light, and collapsible footrest. The entire train offers complimentary Wi-Fi and there is a 120 volt power plug for each seat. The overhead bins are quite roomy and there is space in each car for luggage too big or heavy to store overhead. Each car has its own restroom (much roomier than any airplane’s facilities). Each car’s climate control can leave you chilled or comfortable so I recommend dressing in layers. Every train has a cafe car selling food and beverages which you can eat at a counter there or take back to your seat. Moving from car to car is not the Indiana Jones experience it was fifty years ago; doors open automatically as you approach and the floor where the cars join only moves a little bit more than the joined cars on Boston’s Green line. Every Acela has a Quiet car too. Phones and electronics which make noise are not allowed here. A “library atmosphere” is maintained, with the expectation that conversations will be brief and low volume. I enjoyed the quiet car, using my time on my laptop, knitting, and watching the world go by. Is the Acela for you? That will depend on your preferences (land vs. air transport) and your time requirements. You can get from Boston to downtown New York as fast by train as by plane once you consider check-in time for flights and travel from airports to the city center. Traveling longer distances, though, deserves careful consideration. It might be the best option. It certainly provides some entertainment for the young (at heart). This entry was posted in Travel, Uncategorized and tagged Acela, Amtrak, AVE, Penn Station, quiet car, South Station, TGV, trains, travel, Union Station, Washington. Bookmark the permalink. I partticularly like the way that you return to the beginning (young at heart) of your Acela Experience article. Another nice touch was your recognition of the old-time romance of a train ride. Woody Allen, anyone? I love riding in the quiet car!! And for me, door-to-door is the same amount of time Acela vs. flying, even though I’m only 15 min. from the airport by cab. If I’m going to NYC, or even Philadelphia, I’ll never fly again. Hooray for the Acela! Thanks for writing. The train is a great place to knit too!